Most broadleaf weeds have netlike veins in their leaves and nodes containing one or more leaves. They may have showy flowers. Broadleaf weed seedlings emerge with two leaves. Because of differences in their leaf structure and growth habits, they are easy to distinguish from grasses. A weed’s life cycle has great impact on the selection and success of a given control procedure, so it is important to learn the life cycle characteristics of a weed when you first learn its identity. Annual weeds germinate from seeds, grow, flower, produce seeds and die in 12 months or less. Annual weeds are further categorized by the season in which they germinate and flourish. Winter annuals sprout in the fall, thrive during the winter and die in late spring or early summer. Summer or warm-season grasses, such as crabgrass and goosegrass sprout in the spring and thrive in summer and early fall. Perennial weeds are weeds that live more than two years. 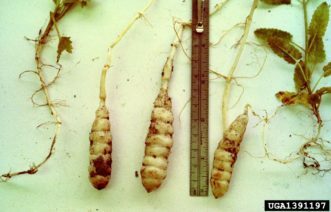 They reproduce from vegetative (non-seed) parts such as tubers, bulbs, rhizomes (underground stems), or stolons (above ground stems), although some also produce seed. Perennial weeds are the most difficult to control because of their great reproductive potential and persistence. Proper identification of weeds targeted for control is necessary in order to select effective control measures, whether cultural or chemical. Further assistance with weed identification is available from any Clemson Extension office or the Clemson Home and Garden Information Center. 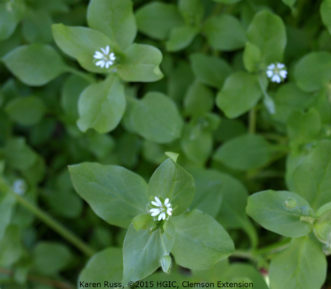 Life Cycle & Description: Common chickweed (Stellaria media) is a winter annual broadleaf weed that commonly infests thin or dormant lawn areas. It germinates in the fall, grows during the winter and produces seed from spring to early summer, then dies. Common chickweed (Stellaria media) with small white flowers is a winter annual weed. You can identify common chickweed by its flat, mat-forming growth habit and small egg- to football-shaped leaves that are arranged in pairs. The stems have a single line of hairs running along their length. Small clusters of white, five-petaled flowers occur at the ends of stems in the spring. Common chickweed reproduces by seed and creeping stems. Sticky chickweed (Cerastium glomeratum), or mouse-ear chickweed, is a mat-forming branched winter annual with fuzzy, opposite leaves that resemble mouse-ears, hence, the common name. The stems are also covered with dense hairs. The white flowers are arranged in clusters at the end of the stems. It is hairy, spreading or erect, and larger than common chickweed. The empty seed cases, which are almost transparent and have 10 teeth, are noticeable. Sticky chickweed reproduces by seed. Perennial mouse-ear chickweed (Cerastium vulgatum) looks like sticky chickweed, but it has creeping stems that often take root to produce new plants. It reproduces by seed and by producing new plants from ground-hugging stems that root at the nodes (the point of attachment of the leaves). Control: Hand pulling is a simple, practical approach for small areas. Improve the health and density of the lawn by fertilizing at the right time and with the correct amount; maintaining an appropriate soil pH; mowing at the recommended height; and watering properly. Apply a 2- to 3-inch layer of mulch to ornamental bed areas to suppress germinating weed seeds. Since this weed reproduces by seed, control it before seeds are produced. Pre-emergence herbicides are available depending on the kind of turfgrass and ornamental plants grown. Optimum timing of post-emergence herbicides is mid-autumn. See Table 1 for pre- and post-emergence control products. Apply all chemicals according to directions on the label. See Table 2 for turfgrass tolerance to each herbicide. Life Cycle & Description: Dandelion (Taraxacum officinale) is a deep-rooted, stemless perennial weed that is probably one of the most widely recognized weeds. It has a long taproot and a basal rosette (circular cluster of leaves radiating from the stem of a plant at ground level) of slightly to deeply cut leaves with lobes that point back towards the base. The rosette remains green year-round. Yellow flowers appear mainly in the spring on long, smooth, hollow stalks. A second bloom occurs in the fall. The leaves and flower stalks exude a milky juice when broken. The flowers give rise to a “puff” ball or globe of parachute-like brown seeds. Seedlings emerge from late spring to early fall, with most emerging in early summer, several weeks after the seeds are shed. Dandelion will grow in almost any soil type and is most commonly found in sunny areas. It reproduces by seed and from new plants that develop from pieces of broken taproots. Common dandelion (Taraxacum officinale) is a perennial broadleaf weed that spreads by wind-blown seeds. Carolina falsedandelion (Pyrrhopappus carolinianus) is a winter annual or biennial with erect branching flowering stems. The leaves are alternate, sharply pointed with leaves that may be deeply lobed or lack lobes. The basal leaves are attached to the stem with petioles; leaves on the stem do not have petioles. In late spring, bright yellow flowers similar to dandelion occur on the ends of stems. The flowers give rise to a “puff” ball comprised of a cluster of brown seeds with a parachute attachment of a long stalk of hairs. It reproduces by seed. Catsear dandelion (Hypochoeris radicata) is also a perennial weed that produces a basal rosette of leaves. Unlike dandelion, the leaves are densely hairy and have irregular to rounded lobes on the leaf margins. 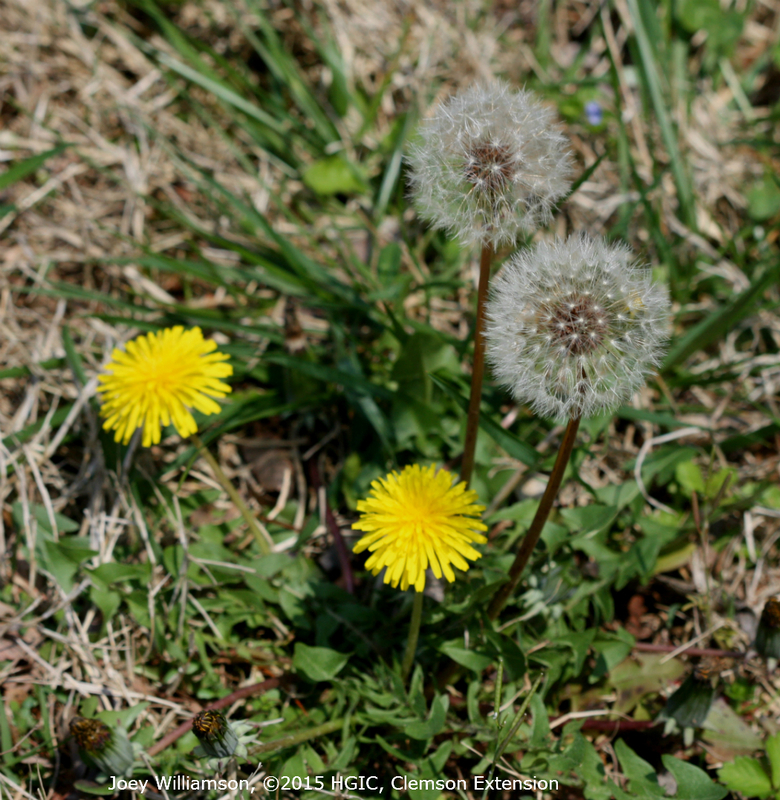 The flower stalk bears two to seven bright yellow flowers that look similar to dandelion. The leaves and flowers also excrete a milky juice when broken. Control: Handpulling can be done with the aid of a tool that removes the entire taproot, especially when the soil is moist. Maintain a dense, healthy turf which crowds out weeds naturally and reduces the chances for invasion. 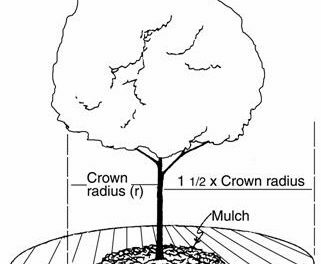 Mulch ornamental bed areas with a 2- to 3-inch layer of mulch to suppress weed seed germination and growth. Remove the flowers before they reach the “parachute stage” to eliminate seed production. There are many herbicides available depending on the kind of turfgrass in your lawn. Optimum timing of postemergence herbicide use is mid-fall. See Table 1 for pre- and post-emergence control products. Apply all chemicals according to directions on the label. Life Cycle & Description: Florida betony (Stachys floridana) is a fast-spreading nuisance of lawns and landscaped beds. It grows in full sun to partial shade and tolerates a wide variety of soil conditions ranging from wet to dry. Florida betony is often called “rattlesnake weed” because it produces white, segmented tubers that resemble a rattlesnake’s tail. Distinctively shaped Florida betony (Stachys floridana) tubers. This cool-season perennial weed emerges from seeds and tubers during the cool, moist months of fall. Throughout the winter months, the plants grow and spread rapidly, often reaching heights of less than 2 feet. Florida betony has square stems and lance-shaped leaves with slightly toothed or serrated edges arranged oppositely on the stems. From late spring to early summer the weeds bear white to pink trumpet-shaped flowers occurring in whorls of three to nine in the leaf axils (the upper angle formed where the leaf joins the stem). In response to the onset of high summer temperatures or cold winter temperatures, Florida betony growth stops and the plant becomes nearly dormant. Florida betony reproduces primarily from tubers but also from seeds and rhizomes. Control: Maintain a healthy, dense lawn by fertilizing and liming according to soil test results and mowing at the proper height and frequency. 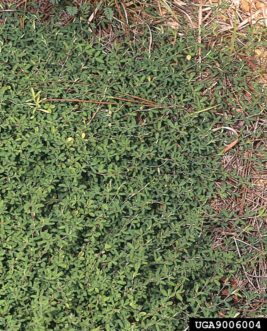 Healthy lawn grasses can out-compete Florida betony for light, water and nutrients and reduce the level of infestation. Suppress growth by applying a 2- to 3-inch layer of mulch such as pine straw or pine bark around shrubs and trees. Using landscape fabric weed barriers beneath the mulch layer will further hinder its emergence. Pull or dig out all plant parts, especially the tubers, when the soil is moist. Hoe or cut the top growth down to soil level repeatedly to “starve” the plant. Spot-treat with herbicides when Florida betony is actively growing during the cool fall months. Pre-emergence and post-emergence herbicides are available depending on the kind of turfgrass and ornamental plants grown. See Table 1 for post-emergence control products. Apply all chemicals according to directions on the label. See Table 2 for turfgrass tolerance to each herbicide. Life Cycle & Description: Japanese clover (Lespedeza striata) or common lespedeza is a wiry, ground-hugging summer annual that has oblong leaflets that occur in triplets, or threes. A noticeable midvein runs down the center of each leaflet. A parallel arrangement of veins is attached at 90-degree angles to the midvein. The pink to purple single flowers appear in mid- to late summer along the branching stems. Japanese clover reproduces by seed. Control: Handpulling is a simple, practical approach for small areas. Improve the health and density of the lawn by fertilizing at the right time and with the correct amount; maintaining an appropriate soil pH; mowing at the recommended height; and watering properly. Apply a 2- to 3-inch layer of mulch to ornamental bed areas to suppress germinating weed seeds. Postemergence herbicides are available depending on the kind of turfgrass in your lawn. Optimum timing of postemergence herbicide use is early summer. See Table 1 for post-emergence control products. Apply all chemicals according to directions on the label. See Table 2 for turfgrass tolerance to each herbicide. Common lespedeza (Lespedeza striata) prostrate growth habit. Life Cycle & Description: Both buckhorn, or narrow-leaved plantain (Plantago lanceolata), and broadleaf plantain (Plantago major) are perennial weeds that reproduce by seeds. Both produce a rosette or cluster of leaves at ground level and have fibrous root systems. The leaves of buckhorn plantain are narrow and lance-shaped (2 to 10 inches long – about five times as long as wide), often twisted or curled. Raised, parallel veins can be found on the underside of the leaf. 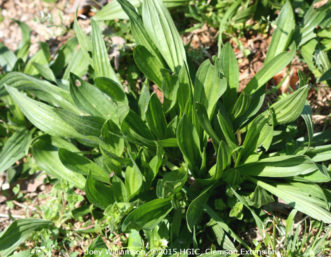 As the name suggests, the leaves of broadleaf plantain are broad and egg-shaped – 1½- to 7-inches long – with several main veins running parallel to the leaf margins. The petioles are sometimes tinged with red at the base. Both plantains produce erect flower stalks from June to September. Buckhorn plantain produces a cone-like spike of white flowers perched at the top of the leafless flower stalk. Broadleaf plantain produces white-petaled flowers along the length of a leafless flower stalk that may be 2- to 18-inches long. Seed germinates in late spring through midsummer and sporadically in early fall. Buckhorn plantain (Plantago lanceolata) is a perennial broadleaf weed. Control: Handpulling is a simple, practical approach for small areas. Improve the health and density of the lawn by fertilizing at the right time and with the correct amount; maintaining an appropriate soil pH; mowing at the recommended height; and watering properly. Apply a 2- to 3-inch layer of mulch to ornamental bed areas to suppress germinating weed seeds. Postemergence herbicides are available depending on the kind of turfgrass in your lawn. Optimum timing of post-emergence herbicides is mid-autumn. See Table 1 for pre- and post-emergence control products. Apply all chemicals according to directions on the label. See Table 2 for turfgrass tolerance to each herbicide. 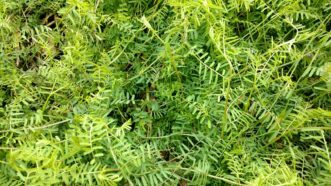 Life Cycle & Description: Common vetch (Vicia sativa) is a winter annual, broadleaf weed that reproduces by seeds that germinate in the fall or early winter. As with all weeds, vetch can quickly invade thin turf areas, especially in sunny areas or moderate shade where there is good soil moisture. It is normally upright and vining, but may have a prostrate growth habit. Vetch grows slowly during the winter, but more rapidly during any period of warm winter weather. It resumes rapid growth in spring and produces violet-purple flowers, which are followed by seedpods. Being a cool weather weed, the plants die as temperatures increase in late spring and early summer. Common vetch (Vicia sativa) is a sprawling, vining weed. Control: Keeping a thick and vigorous growing turf is the best way to reduce the encroachment of vetch. First, select a turfgrass cultivar adapted for your area and light conditions, and then properly fertilize, mow, and water to encourage dense growth. 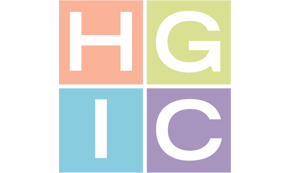 For more information on growing healthy turfgrass, see HGIC 1201, Fertilizing Lawns; HGIC 1205, Mowing Lawns; and HGIC 1207, Watering Lawns. In landscape beds, vetch can be hand dug and suppressed with the use of mulch. A 3-inch mulch layer is ideal to reduce weed growth. Cultural controls should be implemented before applying herbicides for vetch control. However, after taking steps to use the best lawn care techniques, chemical control may still be necessary to further reduce common vetch. Herbicides should be chosen according to turfgrass species and all label instructions followed. Chemical controls for common vetch should be applied in fall or early spring for best results. Keep in mind that herbicide effectiveness is reduced as weeds mature. Three-way herbicides are the most commonly used broadleaf weed killers on bermudagrass, zoysiagrass, centipedegrass, St. Augustinegrass, and tall fescue to control common vetch and almost any broadleaf weed in the lawn. The active ingredients of three-way herbicides include the following broadleaf weed killers: 2,4-D, dicamba, and mecoprop (MCPP) or MCPA. A three-way herbicide will give good control of common vetch. 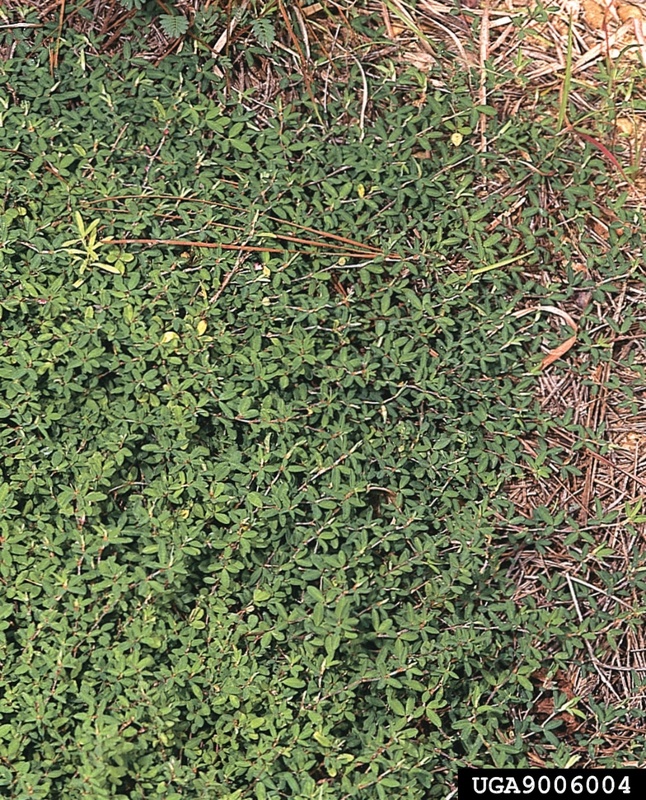 Atrazine may be used to control common vetch in centipedegrass and St. Augustinegrass only. Atrazine is a post-emergence broadleaf weed killer that also controls several common grassy weeds and has some pre-emergence activity. Atrazine will give excellent control of vetch. A recent herbicide combination of thiencarbazone, iodosulfuron, and dicamba, as found in Celsius WG Herbicide, is selective to control many broadleaf weeds and several grass weeds in all four of the common warm-season grasses, but it cannot be used in fescue lawns. Apply when common vetch is actively growing and again 2 to 4 weeks later if needed. The addition of a non-ionic surfactant, such as Southern Ag Surfactant for Herbicides, will increase control. Celsius WG Herbicide is safe to apply during spring green-up of warm season grasses. Celsius WG will give good control of vetch. Metsulfuron can be used for common vetch control in bermudagrass, centipedegrass, St. Augustinegrass, and zoysiagrass. Quali-Pro MSM Turf Herbicide is a product that contain metsulfuron, and Quali-Pro Fahrenheit contains dicamba along with metsulfuron, but these are packaged for landscape professionals. Metsulfuron will give excellent control of vetch. Do not apply metsulfuron to lawn if over-seeded with annual ryegrass or over-seed for 8 weeks after application. 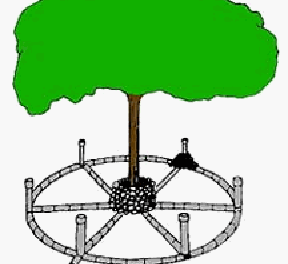 Do not plant woody ornamentals in treated areas for one year after application of metsulfuron. Do not apply metsulfuron herbicides within two times the width of the drip line of desirable hardwood trees or if temperature is over 85 °F. For these professional products, a non-ionic surfactant (such as Southern Ag Surfactant for Herbicides) is required at 2 teaspoons per gallon of spray mix for best control. See Table 1 for herbicides and specific products. See Table 2 for turfgrass tolerance to each herbicide. Glyphosate: When herbicides are applied to beds intended for future planting of ornamentals, care must be taken as various herbicides may injure the plants to be installed. For planned beds, glyphosate has far less soil activity (a few days) as compared with the three-way herbicides or atrazine (a few weeks). Glyphosate is the safest choice for spray application in existing flower and shrub beds, so long as care is taken to prevent drift to non-target plants. Glyphosate applications are much less apt to move through the soil, be absorbed by roots, and injure existing woody ornamental shrubs. Natural-based, Burn-down Herbicides: For those who would prefer not to use glyphosate for weed control in landscape beds or areas to be kept free of weeds, several non-selective, burn-down herbicides are available that are based on more natural products. This does not mean that they are safer for the individual doing the spraying – caution is always advised. Even natural products may irritate or burn the skin or injure the eyes, especially in the concentrated form. Read the product label for safe use and protective clothing (such as coveralls). It is advisable to wear rubber boots to prevent contact when walking through areas being sprayed, as well as wearing protective goggles and a pair of rubber or top quality dish washing gloves to help protect your hands and forearms from exposure, especially when mixing and adjusting the sprayer nozzle. Also keep in mind that sprayer wands often leak. Please note that burn-down herbicides do not translocate into the root system, which means that for perennial and tougher to kill weeds, the weeds may regrow from the roots and require additional sprays for control. These products control actively growing, emerged, green vegetation. However, by being persistent with the spraying of any weed regrowth, even the toughest of weeds can be controlled. Do not allow sprays to contact desirable plants. Note: Pelargonic acid is a fatty acid which occurs naturally as esters in the oil of pelargonium. It is often called nonanoic acid. The ammonium salt of nonanoic acid, ammoniated nonanoate, is an herbicide. Table 1. Examples of Herbicides for Broadleaf Weed Control in Turfgrass and Landscape Beds. Not for use in landscape beds. Will control virtually all broadleaf weeds, although multiple applications may be needed on select weeds. St. Augustinegrass only.Will control many, but not all broadleaf weeds. Good to excellent control of chickweed, dandelion, lespedeza & many other weeds. Fair to good control of Florida betony & plantain. 57.4 For use on Bermudagrass, Zoysiagrass, Centipedegrass, St. Augustinegrass. Gives very good control of many broadleaf and some grass weeds in lawns. Not for use in landscape beds, nor on tall fescue lawns. Granules For use in landscape beds and on all turfgrass lawns. Prevents burweed, buttercup, chickweed, henbit, pennywort, speedwell, spurge, yellow woodsorrel. Granules For use in landscape beds only. Small amounts getting into lawn adjacent to beds should not hurt lawn. Prevents same as above, plus plantain, dandelion, bittercress, fireweed, pigweed, pokeweed, henbit, shepherd’s purse, white clover, crabgrass. Granules For use in landscape beds & on warm season turfgrass. Granules For use on all turfgrass lawns. 1 RTS = Ready to Spray (a hose-end spray bottle). 2RTU = Ready to Use (a pre-mixed spray bottle). Note: Do not apply post-emergence herbicides, except Celsius WG Herbicide, to lawns during the spring green up of warm season turfgrass. 2 Celsius WG requires the addition of 2 teaspoons of a non-ionic surfactant (that is, a wetter-sticker agent to aid in weed control at 0.25% by volume) per gallon of water, such as Hi-Yield Spreader Sticker. Spot treatments to St. Augustinegrass at temperatures above 90 degrees may cause temporary growth regulation. Table 2. Turf Tolerance to Herbicides for Common Vetch Control. D = Fully dormant turf only.Note: Do not apply post-emergence herbicides, except Celsius WG Herbicide, to lawns during the spring green up of turfgrass.1 This mix of active ingredients requires the addition of 2 teaspoons of a non-ionic surfactant (that is, a wetter-sticker agent to aid in weed control at 0.25% by volume) per gallon of water, such as Hi-Yield Spreader Sticker.2 Spot treatments to St. Augustinegrass at temperatures above 90 degrees may cause temporary growth regulation. Note: Read and follow all label instructions when using herbicides. Herbicides containing 2,4-D should be applied at a reduced rate on St. Augustinegrass and centipedegrass to prevent damage to these lawns. The product labels will give the rate to use for each type of turfgrass. If a second application is needed, it is safest to apply the herbicide in spot treatments. Repeated applications of a three-way herbicide should be spaced according to label directions. Do not mow within 48 hours after application of most herbicides. Most post-emergence herbicides need to dry on the leaf surface before irrigation or rainfall occurs. See Table 1 for turfgrass tolerance to herbicides. Most herbicides should not be applied during spring transition (green-up of lawn) or when air temperatures exceed 90 ºF as this can cause severe damage to the turfgrass. A newly seeded lawn should be mowed a minimum of three times before applying an herbicide. Rainfall or irrigation a day or two prior to herbicide application reduces the chance of turfgrass injury and enhances weed uptake of the herbicide. Next Menu Labeling… will it change what you eat?